Cast your mind back to 1991. Reebok were killing it right then: KILLING IT. They’d put out Pump first by putting it out at the end of 1989, put out a series of ads with athletes talking smack about their Nike-sponsored rivals and wanted to take even more of the basketball market. After conversations with players about how shoes were wearing out during outdoor games, the Reebok Blacktop initiative was launched with shoes boasting car tyre-style rubber compounds and heavier leathers than other basketball shoes — it was launched alongside a Reebok-sponsored tournament too, plus ads with Sinbad in. And while Pump was the hype back then, it was actually cheaper shoes like the Boulevard Mid, with their brutal looks and Hexalite tech that shifted units to start. That Blacktop logo is screamingly 1990s, but many will recall lusting after the Blacktop Pumps Nike’s reaction was to publicly dismiss the idea of making outdoor specific basketball shoes, but a Post-It memo from one Phil Knight on Mark Parker’s door that same year asking for an outdoor basketball shoe ended up on Tinker’s desk. 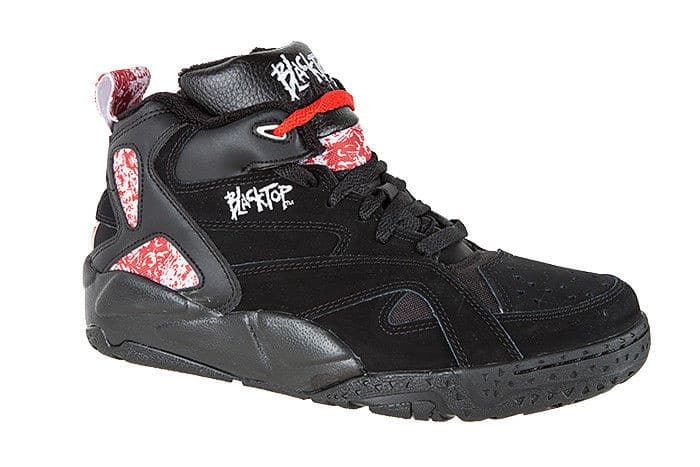 It was a reaction to Reebok and the Air Raid would drop in 1992 as a Blacktop retaliation. So you can thank this series for that drop too — just in case you were labouring under the misapprehension that Reebok took this one from the Nike play book. We recall the Blacktop Boulevard name was connected to a handful of shoes (including Pumps) and the rear paneling on this one is more appealing than the shoes we remember seeing and that appropriately rugged patterning on these variations brings back Blacktop in style.